How often we hear the advertising claim that such-and-such is a “real family business”? Well, in the case of Bennetts Coaches, we do indeed have a thoroughbred family business, now in the hands of the third generation who are continuing to build on the foundations firmly laid by their predecessors. The story starts with Arthur Ernest Bennett, born in Gloucester on 22 March 1924 at Hempsted and was the eldest of eight children. 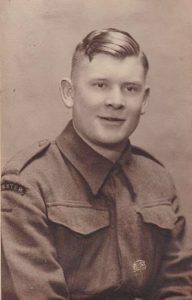 Arthur served proudly in World War II firstly as a member of the Gloucestershire Regiment and later in the 1st Air Landing Light Regiment which was raised in 1943 as an airborne forces unit of the British Army‘s Royal Artillery. Arthur served in Operation Slapstick which was part of an amphibious landing in Italy, returning to England in September 1944. During Operation Market Garden, an airborne assault in the Netherlands, they landed 60 miles behind German lines to capture a bridge crossing on the River Rhine. During the battle of Arnhem, the regiment was one of the divisional units that formed a defensive ring around Oosterbeek. Arthur also took part in Operation Doomsday in Norway in May 1945. After this, the regiment returned to England and was disbanded in December 1945. Upon his return from WWII, Arthur joined the family coal business ‘E M Bennett’ where he continued to work until his father, Ernest Melville Bennett, died in 1956. The coal business was left to Arthur’s younger brother, Leslie John Bennett (aka John), and was subsequently rename ‘L J Bennett’. The rest of the family were left cash and it was this cash that was ultimately used to start Bennetts Coaches. When Leslie passed away, the family business was taken on by his son John (aka Johnny). When the coal yard business ceased, Leslie J Bennett joined forces with Roger Brown and started a company called Blue Anchor Coaches but this ceased trading in a short while. Arthur had married Dora in 1947 and over the following five years the couple were blessed with the arrivals of Pauline, Roy and Peter. In 1954, this growing family was allocated a new home on the fast growing Matson housing development in Gloucester, and a decade later 46 Garnalls Road was to become the initial base of the coaching operation. After Arthur’s father had died, Arthur secured employment as a coach-builder at the Gloucester Railway Carriage & Wagon Works. The Wagon Works (as it was locally known) had an enviable reputation around the world for producing a wide range of quality railway rolling stock and associated items, including originally horse-drawn vehicles and tramcars and later for bodies for other road-going vehicles. While the 1950s saw a buoyant business as Europe’s railways were re-equipped following wartime devastation, subsequent contraction of the railway networks and gradual rationalisation of the British Railways organisation following nationalisation, saw a sharp decline in activity at the Wagon Works. A round of redundancies saw Arthur, along with a number of other Wagon Works stalwarts, finding work in the expanding Pressed Steel car production plant in Swindon. This meant a 70-mile round trip each day; Arthur hit upon the idea of acquiring an 11 seater Perkins engine Commer minibus and by sharing the costs with his colleagues this proved a very economical proposition. Arthur’s red minibus, bought new in July 1962, soon caught the eye of Unit 3, a local dance band, and a deal was done for Arthur to drive them to their weekend gigs. This unexpected arrangement of course further subsidised the cost of Arthur’s travel to work. The minibus was quickly clocking up the miles and the following year Arthur not only took over his brother’s minibus but also acquired a 4-year old Austin 11-seater. The latter was the more significant of the two as it had been built to PSV specification, and, following the granting of an appropriate licence to Arthur, he was able to use it for hiring to the general public. With the PSV licence under his belt, Arthur decided to leave Pressed Steel in order to devote all his time and energies to work full time hiring out minibuses or self drive. Several other small vehicles followed, but in 1966 a major step forward saw the arrival of the first full-size coach, a Bedford 41-seater. As the workload increased, Arthur’s daughter, Pauline, started to help out by looking after the administration and accounts whilst still attending Linden Secondary School. Roy obtained a PSV driver’s licence as soon as he reached the requisite age, and immediately joined his father in the business. In 1971 Arthur took on a schools transport contract with Gloucestershire County Council; the school was in Fairford, some 27 miles from Gloucester, in a predominantly rural area with no indigenous coach operator. Five coaches were needed for this work, and Roy moved to Fairford to become manager and mechanic for this part of the business, and to try and attract some private hire work in that area. The contract ran for 5 years, at which time the council decided to experiment with an in-house school bus fleet. Further contract work, both with the Council and for local factories, was acquired in the Gloucester area and at the end of 1974 the fleet had reached 20 vehicles. 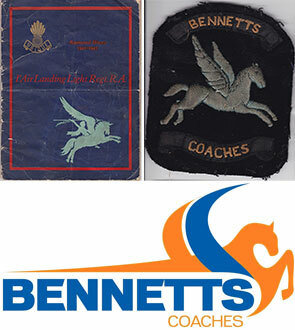 A livery of blue and grey was applied to almost all the Bennetts fleet, and for some years all displayed the Pegasus emblem. This was the military badge of the Parachute Regiment, with which Arthur had proudly served. The Pegasus remains on our corporate uniform and stationery today. In the early days of the coach operation vehicles were to be found parked on the streets of Matson. As the fleet grew, a half acre plot of land was rented from Gloucester County Council in 1966 and a move was made to the site in Chase Lane, off Eastern Avenue, Gloucester and where a maintenance building for two coaches and an office were erected at the rear of the parking area for a cost of £1,000! Security was provided by Sheba the Alsatian, a fearsome looking beast who was actually the softest dog you could hope to encounter! As the business grew, Pauline joined the business full-time taking on the administration and finance, having previously worked in the Gloucester offices of Walls Ice Cream. Arthur’s youngest son, Peter, joined in 1973 to assist his father with the wider business aspects after having obtained a HND in mechanical engineering at W S Barron & Son (locally known as Simon Barrons), also based in Gloucester. 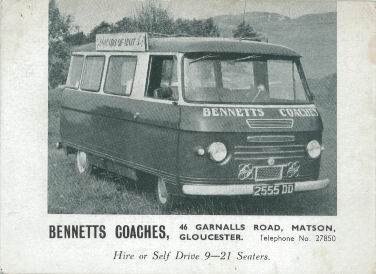 1976 and 1977 were significant years for Bennetts Coaches. The larger bus companies who had traditionally provided most of the local bus services were looking closely at their costs, and finding that falling passenger numbers were resulting in some of their routes falling below an economic threshold. One such was that between Gloucester and Ledbury via Newent. Gloucestershire County Council needed to find a solution and set up a joint operation with three coach operators (one each from Gloucester, Newent and Ledbury) to provide services over this route. Thus on 23 August 1976, Bennetts Coaches took on its first public bus service. Under the provisions then available, this qualified the operator to acquire a new vehicle at a subsidised price for use predominantly on public services; Bennetts sensibly took advantage of this scheme which enabled them to buy their first brand new full-size coach, a Duple Dominant Express-bodied Ford R1114 53-seater, placed in service on 1 January 1977. School services in the Newent area were subsequently added to the portfolio, but further changes in the habits of bus users, and the overall economic situation, saw Bennetts gradually surrendering the Newent work some 30 years later. Although 1977 had started on a high, with a brand new coach, sad times were to follow. On 18 July 1977 Arthur Bennett died suddenly and unexpectedly, aged only 53. While other family members had been working with him, the business had been very much Arthur’s “baby”. 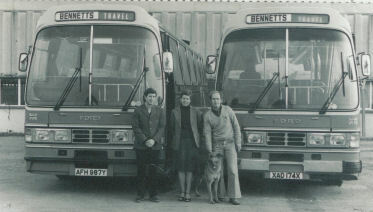 Bennetts Coaches was now owned jointly by Dora, Pauline, Roy and Peter, with Peter very much in the hot seat. Peter had already persuaded his father to dispense with minibuses, and to concentrate on higher quality and more modern coaching stock. A very tidy fleet of 12 coaches was now in operation. In 1979, the family business became a Limited company and P&R Bennett (Coaches) Ltd was founded. Expansion was firmly on the cards, and with local operators Glevum Coaches and Edwards Coaches closing in the late 1970’s, early 1980’s some additional contracts were acquired. While the Chase Lane site had served the company well, it was not well suited to the longer 53-seat coaches now becoming the vehicles of choice. Peter and Roy therefore dug deep and between them purchased a 1.1 acre site in Eastern Avenue which was being vacated by Taylors, the local Ford dealers. In May 1981 Bennetts Coaches occupied the site, just double the size of their previous home, and with five maintenance bays available. A drive-through wash was installed to keep the coaches sparklingly clean. They are still there today, but 35 years on history is repeating itself as even longer coaches, and more of them, are leading to another round of head-scratching. In addition to contract and private hire work, the 1980s saw the development of tours and excursion programmes. However, after a 20-year run, falling demand for such activities led to the eventual cessation of such work, but with a corresponding increase in private hire whereby customers can plan their own itineraries. By 1987 the company owned 22 coaches and 3 cars and was worth in excess of £1million. The highlight of the 1990’s was the introduction, in conjunction with the Councils of Gloucester City and Gloucestershire County, of Park & Ride Services in Gloucester. These initially took the form of Saturday only services into the city centre from St Oswald’s car park and from the Nuclear Electric site at Barnwood. After several years, the latter site was dropped but the St Oswald’s operation was upgraded to run 6 days each week. Bennetts were subsequently awarded the contract to take over the Waterwells site. Although the use of up-to-date, low-floor easy-access vehicles, operating to a high frequency, would appear to be an appropriate way of discouraging car usage in city centres, it is unfortunate that the financial problems which have beset public funding as we moved beyond 2010, saw the Councils decide that the dedicated Park and Ride services could no longer be funded. Bennetts were, however, successful in winning Cheltenham’s Park-and-Ride contract from the Arle Court site in 2004. The next significant venture was that of acquiring in 2010 the National Express franchise for the services between Gloucester, Cheltenham and London with typically 10 departures each day. The vehicles used on these services are required to wear National Express liveries, so may not immediately be recognised as Bennetts’ vehicles. The dedication shown by Bennetts to the operation of these services is reflected by the awards they have repeatedly won. Further recognition of the level of service Bennetts provide has recently been forthcoming by the award of additional National Express duties. Although he continues to retain a share in the business, Roy decided to take early retirement in 2003. In 1998, Peter’s son, Gavin Bennett, had joined the family business and was soon appointed as Fleet Engineer. In 2017 Gavin has become Managing Director, following Peter’s decision to stand down – although he remains as a consultant to the business. After 34 years managing the office and finances, Pauline took the decision to retire in 2007. In 2012, Pauline’s daughter, Melissa Lovell, joined the team bringing with her a wealth of administrative, managerial and HR skills from her previous business management roles in the NHS. Chris Lucassi joined Bennetts as Coaching Manager in 2010, primarily to oversee the National Express work of which he had had experience in previous employment, although he now manages the full spectrum of coaching activity in his positon as Operations Manager. In recent years, following recommendation, Bennetts are proud to have been asked to undertake regular prestigious work for NATO, often involving flights to or from RAF St Mawgan in Cornwall. Although a number of the early coaches were of Bedford manufacture, Fords became the chassis of choice until they ceased production in the 1980s. Double-deckers were also used on school services over a period of some 15 years, but are no longer considered appropriate. DAFs predominated from the mid-1980’s, but the coaching fleet is now standardised on vehicles of Volvo and Mercedes manufacture, together offering the highest levels of quality and reliability. The fleet now stands at 33 vehicles, with an average age of less than 5 years. Apart from those in mandatory National Express livery, or those Park & Ride vehicles painted to meet the Council’s requirements (currently silver with green front panels), the main coaching fleet retains the traditional blue and grey livery, to which areas of a vibrant orange were added in the 1980s. The structure of the company has evolved over the years, the present operating company of Bennetts Coaches Ltd being set up in 2010. In 2017 it became a part of Bennetts Holdings Ltd.
Bennetts Coaches are proud of their 56 years of service to the local community and are always delighted to discuss with both existing and new customers how they might be able to assist in meeting their transport needs, be they in the UK or in mainland Europe.